Our industrial component chain guides are a long-lasting solution available for a wide variety of applications. 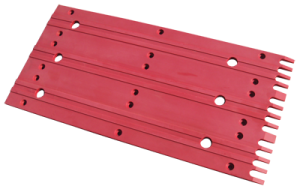 The self-lubricating surface of the nylon-cast minimizes friction and extends chain life. These components are available in a wide variety of sizes and designs, and can be customized for any application.